If you’re ready to invest in the very best the Beverly Hills real estate market has to offer, you’ll need the right broker. From shore-side villas in Malibu to opulent estates in Beverly Hills, having a seasoned expert to guide you through this exciting process is crucial, and at the heart of the elite Westside real estate market is Beverly Hills Realtor Sacha Radford. As a top Beverly Hills Realtor, Sacha has a true passion for exceeding your expectations from the moment you begin working with her. Her intimate knowledge of the market, her professionalism and service, and her distinctive ability to quickly hone in on your tastes allows her to save you precious time and energy in your home search or sale. Sacha knows that buying a property is the most important purchase you can make. It’s not just an investment—it’s your home. Her aggressive negotiating style, attention to detail and protectiveness of your best interests ensures you’ll get the home you want, with the best terms and for the lowest price. When selling your home, Sacha goes above and beyond the call of duty of a real estate agent. She isn’t there to just handle the paperwork and logistics, she is there to sell your home as quickly as possible and get you the best possible price. She has a keen eye for what people want and will prepare your home with incredible precision, assisting you with décor and remodeling as needed to appeal to today’s buyers. She will prepare your home with incredible precision and assist you with décor and remodeling, all with an eye for what appeals to today’s buyers. Your home will be expertly priced and marketed with the latest technology and maximum exposure to attract the most qualified, serious buyers so your home sells fast. Sacha has been one of Los Angeles’ finest, award-winning Realtors for more than fifteen years and has earned the respect of her colleagues as well as the trusted referrals of her clients. "Sacha brought experience, industry savvy, intelligence, professionalism, sales aggressiveness, winning attitude and positive results. She brought generous amounts of personal care, warmth, kindness, beauty, grace, charming personality and uplifting spirit. She went over and above the call of duty to arrange all kinds of details, and became a trusted partner in every decision of the endeavor. She demonstrated a command of the sales climate of the area, the profiles of potential buys and knowledge of historic and demographic movement over time." Sacha grew up in San Diego and has a deep love for the Southern California way of life. A graduate of Pepperdine University in Malibu, Sacha has lived in Los Angeles for 24 years and is extremely knowledgeable in all areas and markets of our beautiful city. On her free time Beverly Hills Real Estate agent Sacha Radford dedicates her time to international aid work, volunteering, animal rescue, nature, photography and the arts. 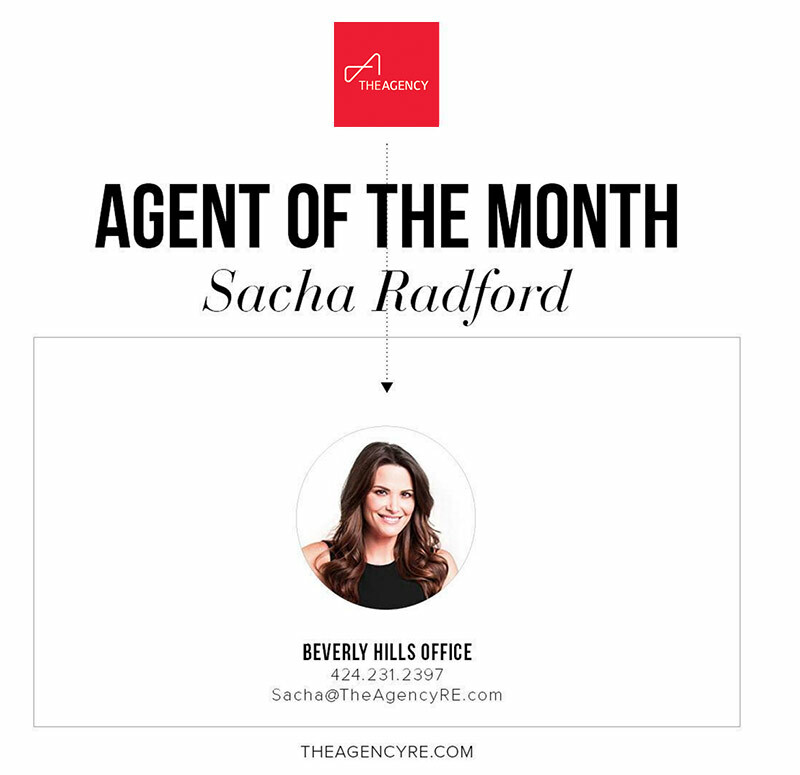 As one of the top Realtors Beverly Hills lays claim to, Sacha is proud to be a member of The Agency. This widely respected luxury real estate brokerage represents properties and clients worldwide. The Agency's founding partners, including Mauricio Umansky have been recognized by The Wall Street Journal as the #1 top-producing agent in California and the #3 top-producing agent in all of the United States. Shunning the traditional brokerage model of cut-throat agents competing against each other, The Agency fosters a culture of partnership in which all clients and listings are represented in a collaborative environment by all its agents, thereby ensuring its clients and listings have the competitive edge. This approach has proven highly successful. In less than two years, The Agency has closed more than $2 billion in residential sales and established itself as one of the preeminent players in the luxury real estate market, representing many of the country’s most visible and high-end properties. The Agency extends far beyond what a conventional brokerage firm offers. It envisions itself as both a lifestyle company committed to informing and connecting global communities, and as a creative agency offering design, marketing and sales solutions for buyers, sellers, developers and investors across the globe. Our in-house team of graphic designers, analysts, tech gurus and marketing strategists work with the agents to provide unparalleled service to every client. We collaborate with clients to design and implement a tailored, full-service marketing strategy for each new listing at The Agency, utilizing our relationships with traditional and new media outlets—and leveraging the most emergent technologies and social media strategies—to ensure maximum exposure for every property we represent. Sacha’s expertise in the Beverly Hills real estate market and The Agency’s powerhouse resources combine into a very unique and successful partnership. This success is proved by happy clients, getting the home of their dreams or selling their home quickly and at a great price.